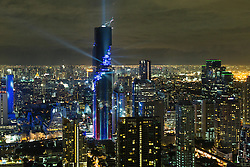 MahaNakhon (Thai: มหานคร) is a luxury mixed-use skyscraper located in the Silom/Sathon central business district of Bangkok, Thailand and was opened in late August 2016. It has a unique pixelated facade, it features the unconventional appearance of a glass curtain walled square tower with a cuboid-surfaced spiral cut into the side of the building. 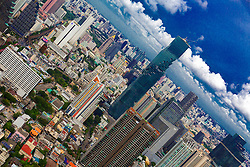 Following transfer of the first residential units in April 2016, it has been recognized as the tallest building in Thailand on 4 May by CTBUH at 314.2 metres (1,031 ft), with 77 floors. Featuring hotel, retail and residences, 200 units of The Ritz-Carlton Residences, Bangkok inside the building are priced between around US$1,100,000 to US$17,000,000, making it one of the most expensive condominiums in Bangkok.